Light Up Fairy Wings are the ultimate costume accessory! Affordable, adorable & matches everything, add LED Light Up Wings to any outfit and voila you are a whimsical fairy princess or a sparkling butterfly! To activate your Blinking Fairy Wings, press the button on the battery pack. 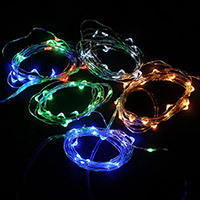 Multicolor LED lights flash continuously. The lightweight, compact size wings are a sheer material with glued on glitter designs. Wings are approximately 14.5 inches high by 17 inches wide. Light Up Fairy Wings come ready to use with 3 replaceable AG10 Batteries.